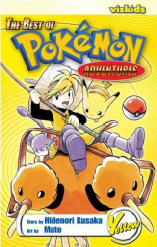 In 2006, Viz released two "Best of Pokémon Adventures" volumes. These books collected various stories from the seven volumes that were translated by Viz. Many fans find these volumes to be confusing because they leave out crucial portions of the stories, while others feel that these serve as a good "sampler" of the story. Below is a listing of which chapters are included in which volume. 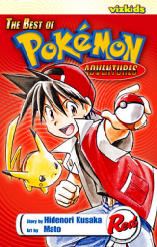 The first volume collects chapters from Volumes 01-03. "A Glimpse of the Glow"
"A Charizard and a Champion"
The second volume collects chapters from Volumes 04-07. Volume 06 is skipped entirely in the "best of" release. "The Beedrill All and End All"